Each day of the week is very different for us. Some days we’re with friends all day, or we might spend a whole day immersed in a hands-on science project. But the day I’m sharing here – Thursday – follows a similar pattern each week. Because we’re out over lunch, there’s no time for big projects. Instead, we fit in lots of shorter activities and reading aloud. It might be my favourite day of the week! I wake up and meditate, then come downstairs to let the dogs out. 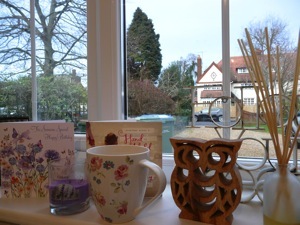 After I’ve unloaded my part of the dishwasher, I savour the day’s first cup of tea and a bowl of porridge in my study. Greeting the day. Blue(ish) sky! I do my daily German Duolingo lesson. Usually I catch up on emails and blogs at this time, but today C(10) gets upset while practising her guitar and needs a pep talk. She’s having difficulty adjusting to her new teacher, and is being a bit tough on herself. I give her a cuddle and remind her that she can’t solve anything when she’s feeling down. She agrees we’ll talk about it again later when she’s feeling better. J(8) asked to learn about quantum physics this term. The Uncle Albert books are a wonderful introduction to the subject. Last week we heard about special relativity in The Time and Space of Uncle Albert. Lots of big ideas to talk about as we read! J(8) asks to try tea, so I make him a cup of lemon and ginger with a dash of agave. He’s not impressed! C(10) and I do Latin and then maths together. Right now we’re working through Math Mammoth’s Division 2. Although we don’t follow a curriculum, individual books from the Math Mammoth Blue Series are great value when a child needs extra practice on a particular topic. 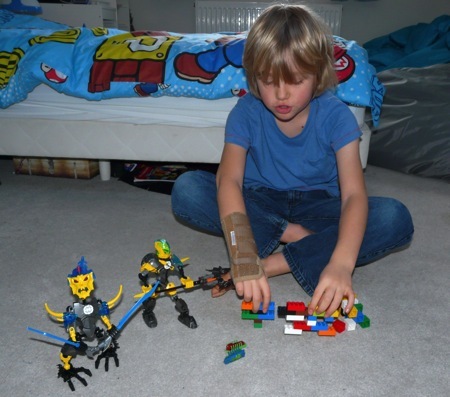 J(8) plays with Lego in his room. He tells me about the RPG game he’s invented with them. We leave for French class at 11:40 and we’re not back until 1:40, so we eat pancakes before we leave. I read aloud from Puddles in the Lane, a lovely story about a family of children evacuated from the London Blitz during World War II. C(10) has 15 minutes one-to-one with the French teacher before J(8) join them for an hour. I walk the dogs in beautiful nearby woods. The children emerge from their class with Valentines “coeur” cookies. After lunch (soup and sandwiches), I practise guitar while the children play Minecraft together. J(8) is paying her Minecraft gold to build houses for him in a world he’s created. I do maths with J(8). I suggest that he tries the division pages C(10) enjoyed earlier. As soon as I read out the first question, J(8) starts to roll around the floor on a space hopper. I have an epiphany. It occurs to me that J(8) has as much difficulty concentrating on maths while he’s sitting still, as I do when he’s leaping around the room. (Sometimes I need to be reminded of something a thousand or so times before the penny finally drops.) I decide that as the grown-up, I need to to overcome my difficulty focusing, and find a way to accommodate J(8)’s wiggles. It works! We actually manage to maintain enough momentum for him to learn some new maths. This much movement in 30 seconds of maths! 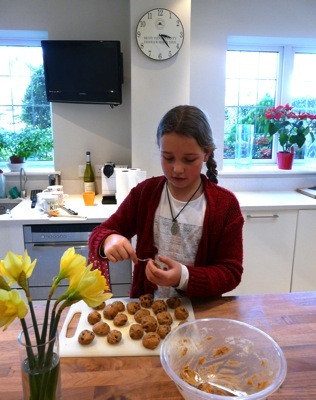 Meanwhile, C(10) mixes up a batch of chocolate chip cookie dough. We bake six cookies and freeze the rest. We enjoy C(10)’s cookies at Poetry Tea. She reads an extract from The Pied Piper, from our new poetry book, A Child’s Introduction to Poetry (thanks, Lisa), and “Double, double, toil and trouble” from Macbeth. 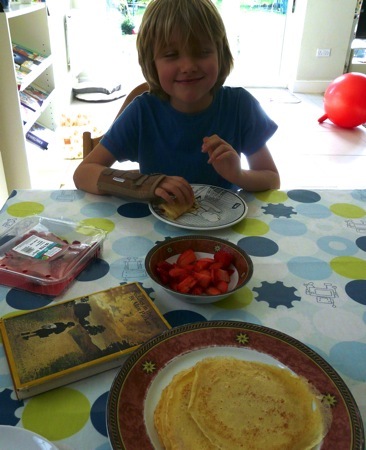 J(8) chooses poems from A Children’s Treasury of Milligan, which he received for Christmas. J(8)’s comic narration and Spike Milligan’s poetry are a match made in heaven; C(10) and I are very grateful to Santa! After poetry tea, C(10) asks me to join her while she practises guitar. She plays beautifully, this morning’s upset long forgotten. 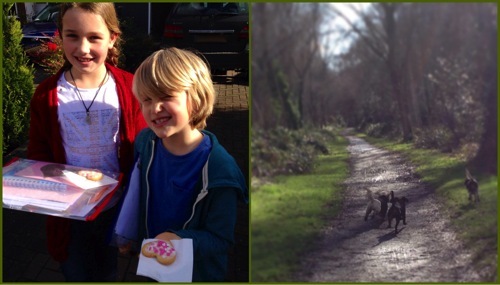 Thank you, Hwee, for the inspiration to join Simple Homeschool’s Day in the Life series! So glad you’ve decided to join in the fun and write about your day. 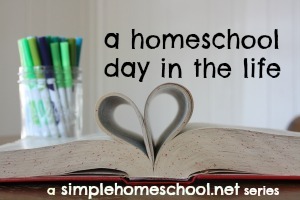 It’s always interesting for me to read about another homeschooling family’s day and to see how they spend their time. Thank you for the inspiration, Hwee. I read Jamie’s blog but I must’ve been a bit behind and hadn’t noticed the linkup. I’m really looking forward to reading everyone’s posts there. That’s reassuring to hear Tiger used to be a wiggler too! It’s funny, my brain understands perfectly that J needs to move in order to concentrate, and I’ve always been okay with him rolling and climbing around while I read aloud. Thanks, Rebecca. I know what you mean – 8 is such a cute age for boys, isn’t it? Old enough to share the theory of relativity with but little enough to warm your heart with their wiggles! I loved this cute post! Poetry teatime sounds like such fun. What a fun day. Thank you, Camie! Poetry teatime is definitely a highlight of our week! What a great day! I love the variety and self study. Hi Kelly 🙂 Yes I think the variety is what I like best about our Thursdays. 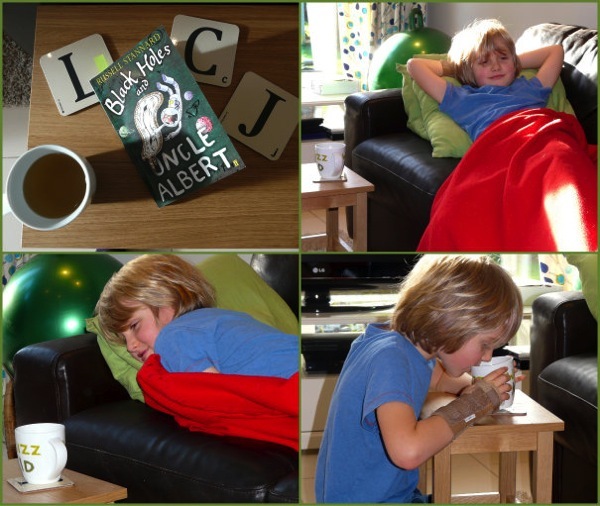 Poetry teatime – what a LOVELY idea! Thanks so much for joining in our series! Thank you so much Jamie. I am thoroughly enjoying reading everyone’s posts at the linkup! I love peeking into other people’s routines! The poetry tea time is a wonderful idea. I may have to try that. Do try poetry tea, Jennifer! It’s one of the easiest but most rewarding parts of our week. Julie Bogart (Brave Writer) is a genius to come up with the idea of pairing poetry and edible goodies! What a lovely day in the life. Thank you so much for sharing it. I love how you’re learning guitar and German- there’s no better way to inspire learning in your children! I have a wiggly one too! At 13 he is still full of wiggles 🙂 Love the poetry and tea time. I love “day in the life” posts – it is always interesting to me to see how other homeschoolers spend their day. Your day looks lovely. I love, love the idea of poetry tea and I also love how much reading aloud you do. I still do that with Keilee. 🙂 Love this day! Thanks for sharing your day! Isn’t it great to be able to let the kids learn in their own styles? Absolutely, Carol! I enjoyed reading yours, too. I so enjoyed a peek into someone else’s day that is so different from mine. What fun! Thank you for sharing! Ok, so I love how you shared your day. Sure, with the outline of all the things to get done, but the pictures told the stories so much clearer. I loved the candidness of the photos. relaxed, enjoyable, but getting things accomplished. like his math movements, trying tea (and not being impressed, ha! 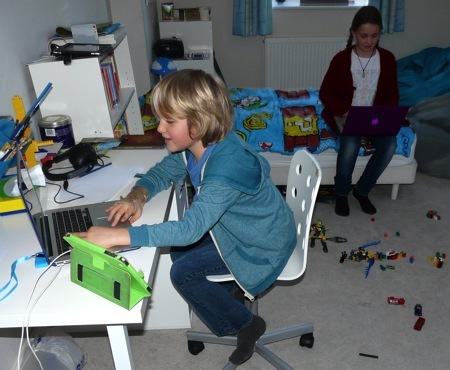 ), legos on the floor while the kids are playing minecraft, … yeah, that’s the beauty of homeschooling… to learn AND live! Great post! This was all kind of fun, wasn’t it? I find it so interesting how different everyone’s day is and then I feel so thankful to be able to have the freedom to do things in a way that suits us as a family, rather than institutionally through school. Yes – freedom is a huge factor for me in choosing this lifestyle! I do love reading about individual projects people do, and their general approaches, but there’s something fascinating about reading a full run-down of a homeschooling family’s day – even if it is a completely unique day! I think it’s great that you are pursuing your own educational goals as well as the children! I have a Minecrafter at my house too! It looks like the ball seat is a hit! Your day looks like it was jam packed with food, fun, learning and outdoor exercise in a lovely place! Thank you so much, Sylvia. Yes, we have oversized balls and space hoppers in both our main learning rooms. They’re essential for my SPD boy to focus! I love the poetry time with cookies! That is a wonderful idea 🙂 My 8 year old daughter loves to bake too. I loved hearing about your day, imagining you in your study eating porridge. I like a bowl of porridge after I’ve run! Walking the dogs in the woods sounds so delightful. It’s good to find something enjoyable to do while our kids are in their lessons, isn’t it? Some ‘me’ time! Thank you for reading about our day. We are very lucky to have many beautiful woods around here. We’ve been walking in woods a lot recently; we usually alternate with the river, but the Thames is flowing at about a hundred miles an hour at the moment, which is fun for us (in wellies) but not so good for exhuberant young pups who don’t know where the edge is! I’ve been very much enjoying your recent posts. I would like to brave Facebook soon so I can join in the conversations you have no doubt inspired! I saw you have a Facebook page. I had mine for quite some time before I finally decided on the best way to use it. It’s a great way to share links to resources and other interesting stuff. I also find some readers prefer to comment on FB rather than on my blog. I hope you will stop by one day. We’ve had some lively conversations recently which has been so good! I love your page! I visited yesterday and was delighted by what I found. Up until now I haven’t had a good FB “routine” (actually, I kind of avoid FB), but your page might be my incentive to change that. What lovely words, Jennifer! Yes – gentle and joy-filled – my ideal kind of day. 🙂 Thank you for stopping by! What a fun idea to record one of your days. So glad you are enjoying the poetry book. We are looking at adding some new ones to our collection. My girls so enjoy our poetry tea times. We’re really enjoying the book, Lisa. I just got around to ripping the CD onto iTunes too so we can listen to the actors’ renditions of the poems, hurray. I hope you will share any other poetry gems you discover! 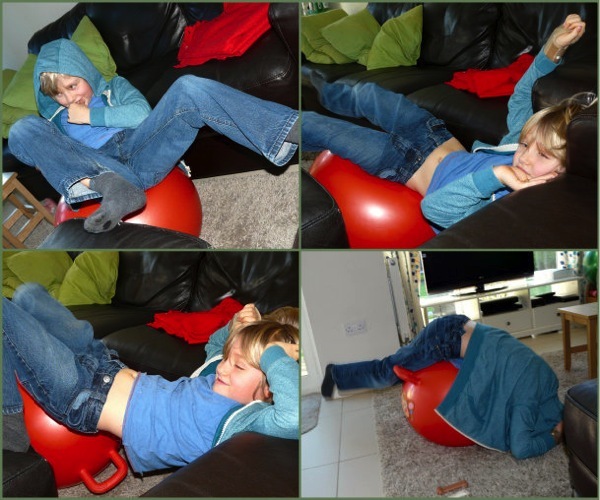 My kids do a lot of school sitting on exercise balls as well.